Shelley Fowles was born in South Africa but has lived in the United Kingdom since 1979. She trained in Art in Brighton and London where her training culminated in a diploma in Graphic Art and Design specialising in Illustration. She has exhibited work in London and Brighton and has designed greeting cards and wrapping paper which have been sold all over the world. At the moment she is illustrating children's books. Recently she has become interested in playing cards from the design point of view. She is attracted to them both as an illustrator and designer because of the fascinating possibilities they offer, within a long tradition. The idea that they are beautiful objects that, at the same time have a function is particularly attractive. 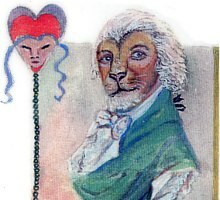 Above: we might ask ourselves What is the meaning of these two-natured, heterogenous beings, half-human and half-animal? Do they represent the ugly vacant spirits of the bourgeoisie? Or are the anthropomorphic figures an allusion to Darwin's theory? Whatever the answer, Shelley has presented us with a luxurious set of thoughtful and artistic miniature paintings - illuminations - evoking an interesting range of cultural, literary and aesthetic ideas. 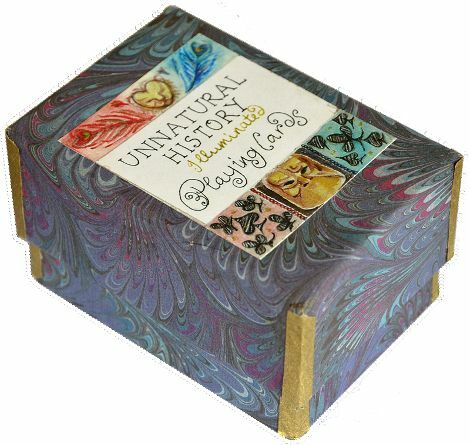 There is a wealth of realism and fantasy in this very pleasing pack of playing cards which combines several innovative features in the design. We are impressed by the zeal and meticulousness with which the artist has planned the whole concept, and also attended to all the details of production herself. A lot of thought and care has gone into this project. All images copyright (c) Shelley Fowles. The idea of Unnatural History is based on the Gothic animal/human mixtures so popular in the Middle Ages. "I tried to make it so that the difference between the halves was not noticeable at first, but came as a shock after further acqaintance with the pack. This seems to have worked with a lot of people!" The suits all reflect different eras. The hearts the eighteenth century, the diamonds the seventeenth, the clubs the sixteenth and the spades the fifteenth. 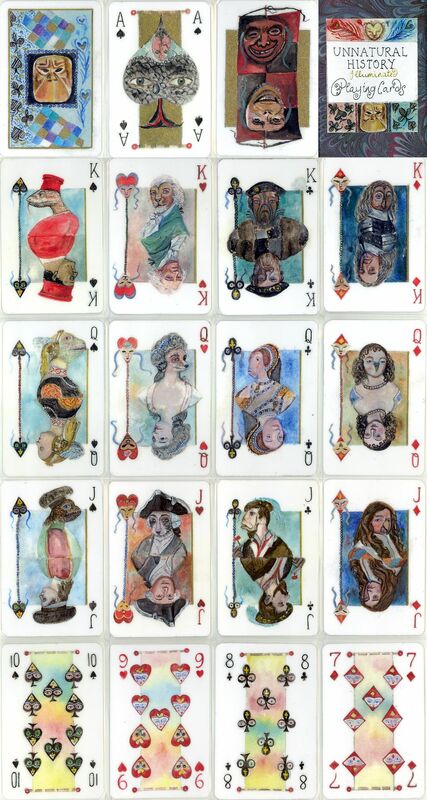 A couple of the court cards are based on portraits of famous people but not all, Jane Seymour, The Duke and Duchess of Sforza, Charles II, Sarah Siddons are there amongst them. Each suit also represents a group of the animal kingdom: Hearts are mammals; Diamonds are birds; Clubs are fish and Spades are reptiles. This is also reflected in the pip cards.